The late director Mukul S. Anand made 3 films with Amitabh Bachchan in the early nineties; Agneepath, Khuda Gawah and Hum. 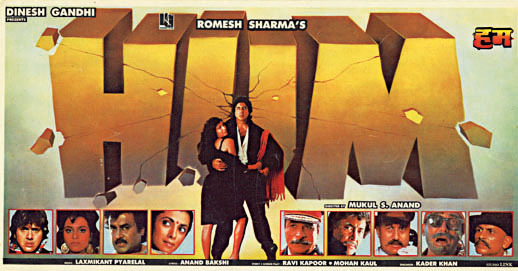 Although my favourite is Khuda Gawah I do have a soft spot for Hum which has a veritable who’s who of actors from the time including Rajnikanth, Govinda, Kimi Katkar, Anupam Kher and Danny Dengzongpa. The story combines the angry young man from Amitabh’s heyday with the sensible and authoritarian father figure he went on to portray in his later movies and he does a good job of transitioning between the two personas. 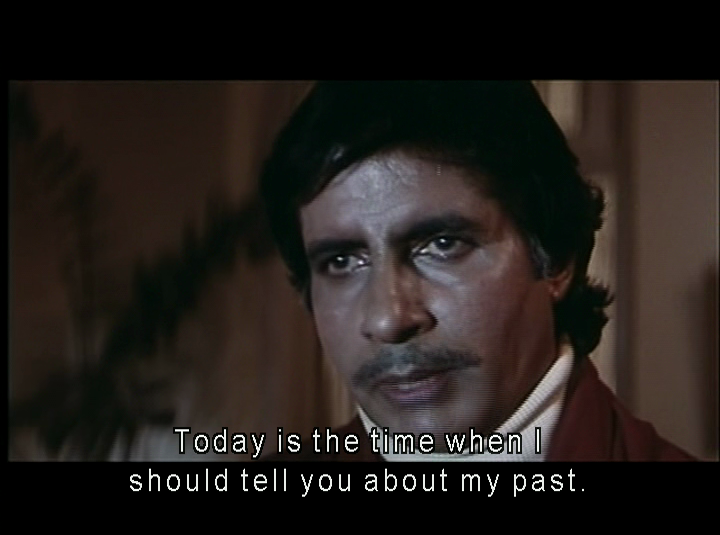 The film was a big hit at the time, and although it does drag a little in the middle, it’s still a great performance by Amitabh as the man whose past comes back to haunt him. 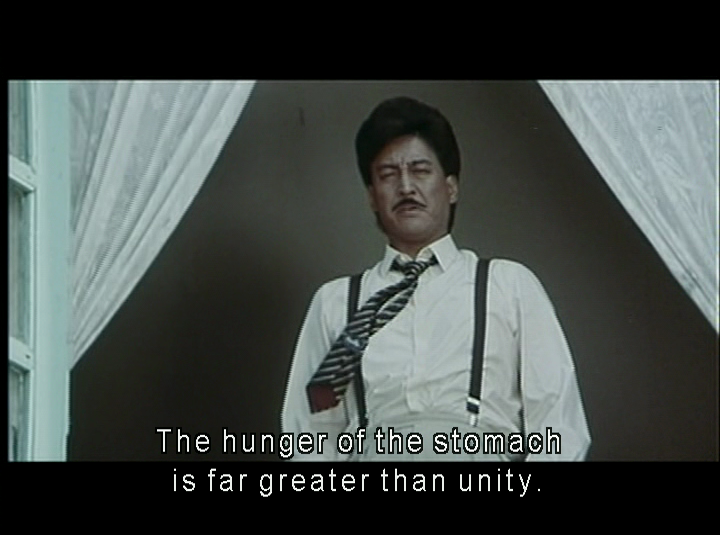 The movie starts as fairly typical masala fare. 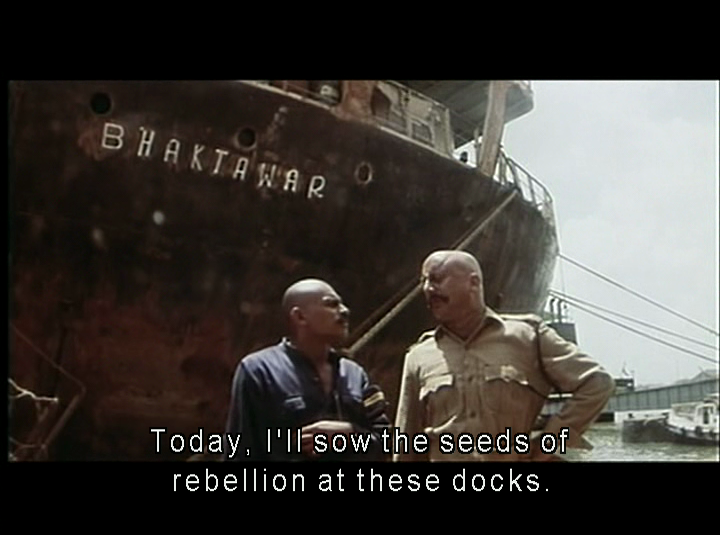 All round bad guy Bakhtawar (Danny Denzongpa) rules over the docks in Mumbai, treating his workers as slaves and killing anyone who dares to go against his despotic will. Despite his general dissatisfaction with this regime, Tiger (Amitabh Bachchan) extorts money from the workers for his father Pratap (Deepak Shirke), who in turn works as an enforcer for Bakhtawar and struggles to keep the peace between his son and his employer. Tiger is in love with Jumma (Kimi Katkar) and the two have a rather stormy relationship, although we don’t get to see very much of them on-screen together. During one rebellion Tiger’s best friend Gonsalves (Romesh Sharma) is killed by Bakhtawar and in the subsequent fall-out Tiger’s father and step-mother also die, leaving two young step-brothers in Tiger’s charge. Tiger immediately sets out to kill Bakhtawar in revenge but is stopped by Inspector Girdhar (Anupam Kher) who has his own agenda, and has set up the whole situation by playing Gonsalves and his revolutionaries against Bakhtawar and his gang of thugs. Girdhar intercepts Tiger and convinces him to fulfil his dying step-mother’s wish and take care of his young brothers while leaving the police to deal with Bakhtawar. In the confusion Girdhar and his faithful sidekick Havaldar Arjun Singh break into Bakhtawar’s safe and steal everything. To cover up their crime they set fire to Bakhtawar’s house, killing his wife and children in the process. At the same time they arrest Bakhtawar and send him to jail, while finally Girdhar blows up the train carrying Tiger and his brothers to eliminate any possible witnesses of his crime. It’s all action in the first half of the film! Amitabh plays his classic role of the angry young man as only he can, even though he looks his age here and actually looks older than his supposed father and step-mother. But there is so much emotion and energy behind the character that apart from moments where the angled lighting shows up the wrinkles, it easy to put aside disbelief and accept Tiger as the slightly tarnished but still heroic saviour of the poor. 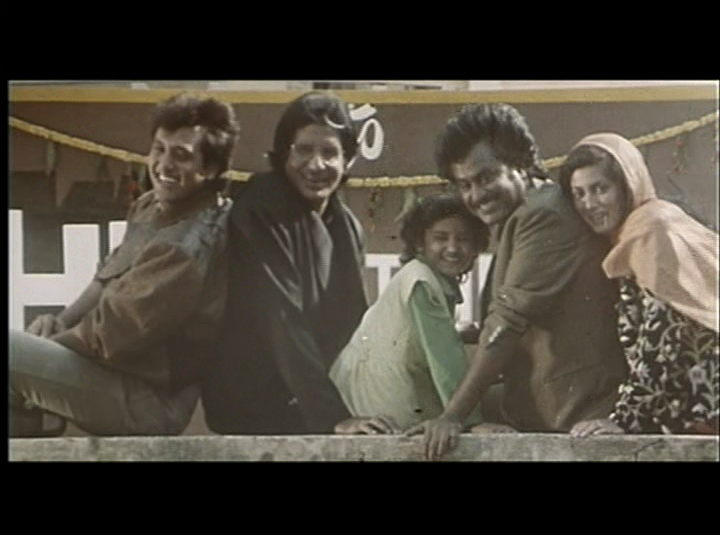 The first half of the film also features Laxmikant-Pyarelal’s classic song Jumma Chumma De De. Chinni Prakash won the Filmfare award for best choreographer in 1992 for his work on this. I’m not sure why the men have mugs of foam, although I presume it’s meant to represent beer and the water hose does seem a little excessive, but do enjoy what is actually a good song. The second half of the film shows an older Tiger (we can tell because he now wears spectacles) who goes by the name of Shekhar and is a respectable farmer and timber merchant in Ooty. 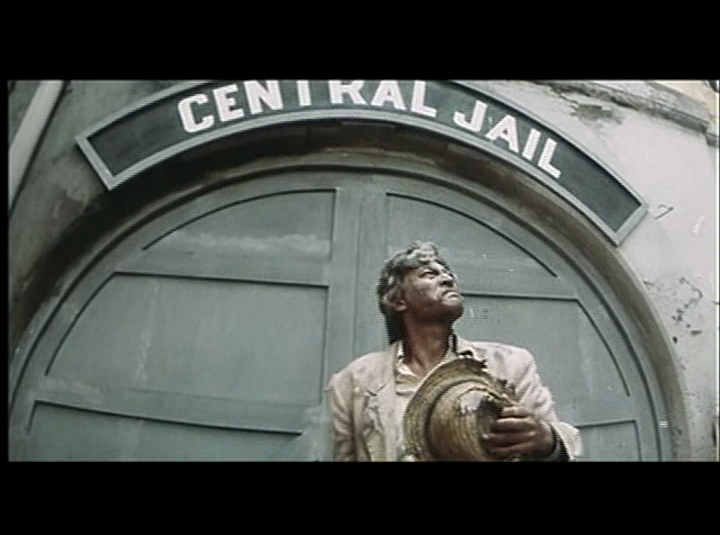 Kumar (Rajnikanth) is a police officer and is married to Aarti (Deepa Sahi) with a young daughter Jyoti. The youngest brother Vijay (Govinda) is a student pursuing Anita (Shilpa Shirodkar), the beautiful daughter of General Rana Pratap Singh (Kader Khan). Neither of the two brothers seems to have any memory of their time in Mumbai and both regard their step-brother as a rather staid and authoritarian figure, whose rules they generally ignore. Meanwhile, Jumma has managed to overcome her early life and is now a successful actress while Girdhar and Havaldar are living well on their stolen riches and selling tanks from their base in Bombay. The middle part of the film tends to drag as it concentrates on the unity of the family and a rather involved romance track with Vijay and Anita slows the pace considerably. There is an unconvincing and unnecessary thread where Girdhar finds a duplicate General as the original has refused to buy his tanks and the whole character of the renegade Captain Attack would have been best avoided.. But things pick up when Bakhtawar is released from jail, still wearing his now rather grimy white suit, desperate for revenge on Tiger for the death of his family. As Shekhar’s past catches up with him, everyone ends up in Bangalore together before somehow managing to get back to the Bombay docks in record time for an exciting and action packed showdown. There are some things that are just never explained. 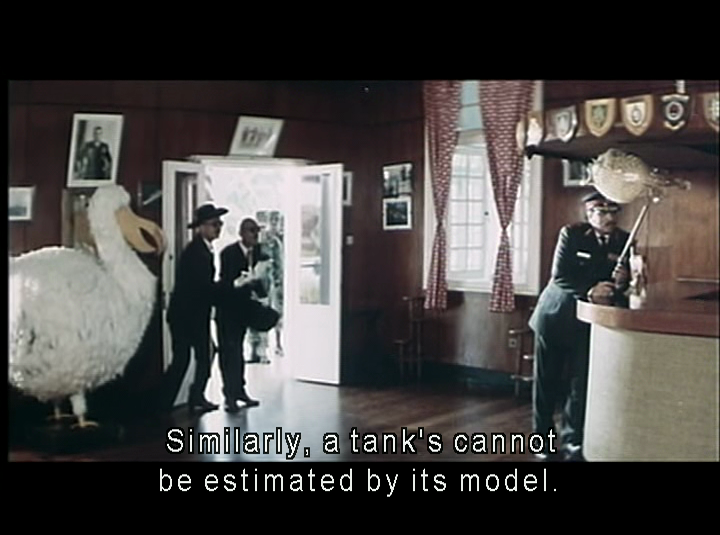 Why there is a giant stuffed dodo in the army officers’ lounge, or a type of puffer fish above the bar we will never know. 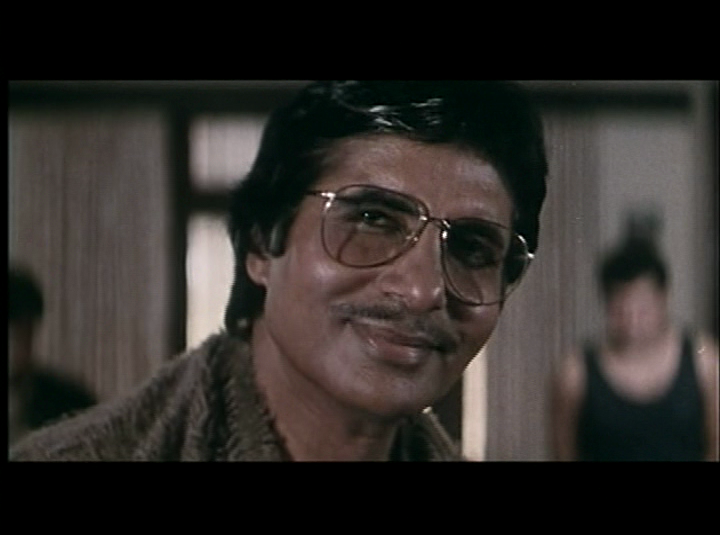 Amitabh suits the role of the older Shekhar much better as he finally looks the correct age. His realisation that his somewhat shady past has finally caught up to Shekhar is brilliantly portrayed and the re-emergence of his Tiger character is excellent. Who knew that all it takes to become an efficient and competent fighter again is a shake of the head and a tiger’s roar! While Rajnikanth has a limited role as Kumar, the scenes where he faces off with Shekhar are excellent and the two actors are very natural together. Govinda is good as the more innocent Vijay, but as his character is there more to add comedy and some light-hearted romance he makes less of an impact. However he does have the best ever disco dance/fight scene and I do like his Crocodile Dundee inspired outfit. Danny Denzongpa can always be relied on as a villain and here he brings depth and character to the role of Bakhtawar. He contrasts the money obsessed businessman with scenes of the family man, although even here his basic nastiness is still clear. As the revenge obsessed ex-prisoner his conviction that Tiger is still alive somewhere is perfectly shown as the driving force behind his increasingly agitated behaviour. The whole character of Bakhtawar is very well written and I like the way flashbacks to his family’s deaths help humanise him and make Bakhtawar more three-dimensional than the typical Hindi film villain. Anupam Kher’s Girdhar is a much more buffoonish character and although his initial scenes as the police inspector are good and at times almost menacing, he becomes more irritating and cartoonish as the film progresses. Deepa Sahi is the best of the actresses and also has the most convincing role as Kumar’s wife. Her attempts to look after the entire family struck a chord, although I wouldn’t have been as happy as she is to be fobbed off with the very annoying song that the family sing together at opportune moments. The music by Laxmikant-Pyarelal is generally good, although apart from Jumma Chumma De De none of it is particularly memorable. This is a masala film that reaches back to some of the classic Amitabh films of the early eighties and he delivers a great performance throughout. Although there are some flaws in the film, particularly in the middle section, there are plenty of great action scenes and excellent performances from the rest of the cast. Worth watching for Amitabh and Danny Denzongpa who steal the show. 3 ½ stars. On paper, this looks like it should be really good. It has a great cast and many of the required masala elements. And I really like a good socialist masala. Sadly, it fails to live up to that promise on almost every count. Mukul S Anand directs with a leaden hand and what little zest resides in the story is overwhelmed by clunky plotting and some poor casting. 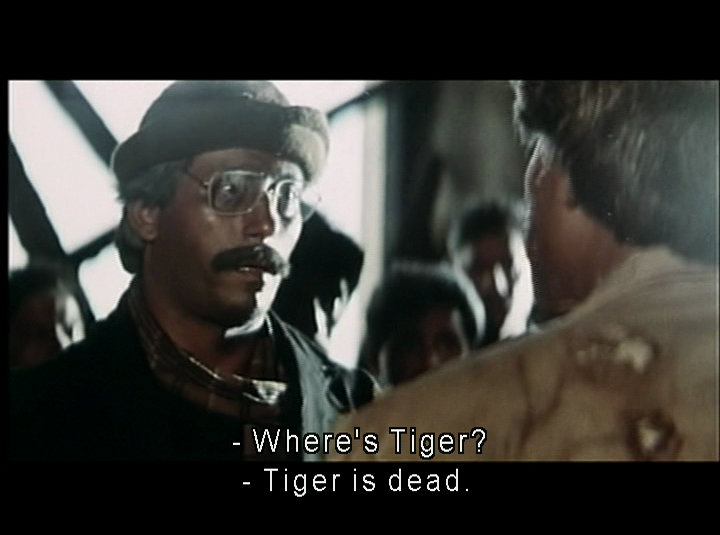 Amitabh didn’t really convince me as Tiger – not just on his physical appearance, but his performance. He had some great moments, especially when Tiger was just hanging around shooting the breeze or drunkenly trying to warn Jumma’s brother, but he sometimes looked like he was just going through the motions of his patented Angry Young Man. 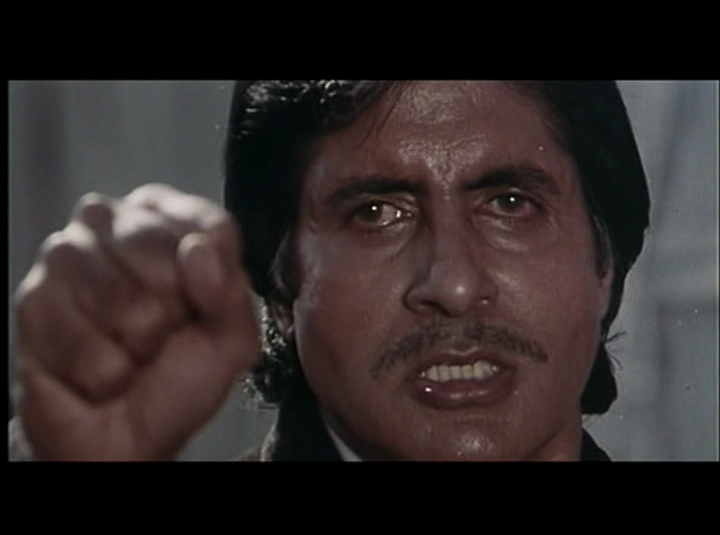 Shekhar suited Amitabh’s air of authority, but was so relentlessly dour. Rajnikanth is cast as an airhead policeman, too dumb to know if the gun he lets his daughter play with is loaded. He just isn’t frivolous enough, and Kumar doesn’t get much to do. 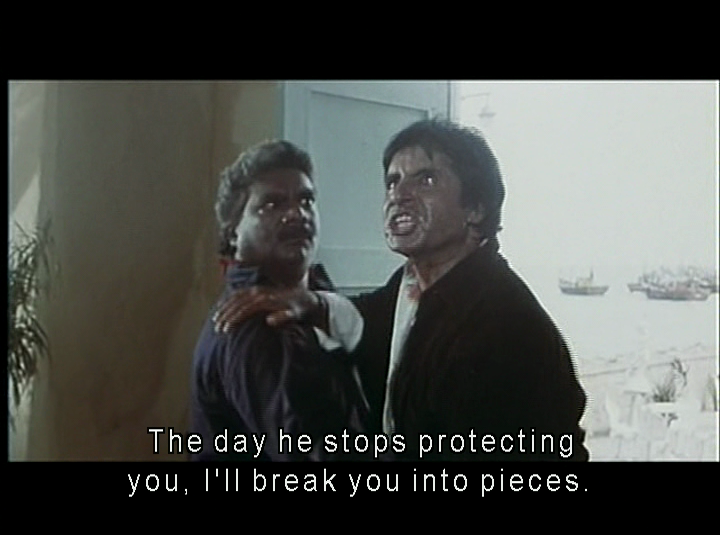 Rajnikanth and Amitabh share a nice rapport, but what a waste of a fine actor. Govinda’s role was totally unnecessary and I wondered if Vijay was added in just to have a dancer in the cast. 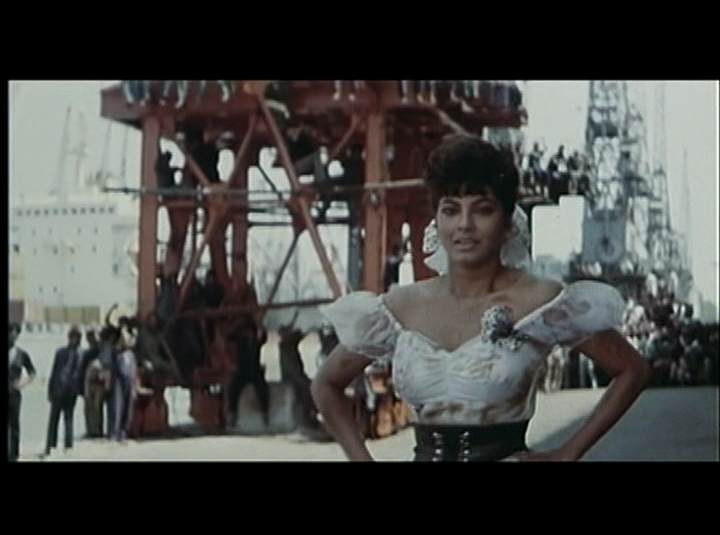 Kimi Katkar is introduced by having her chest heave into view and that is all you need to know about Jumma. 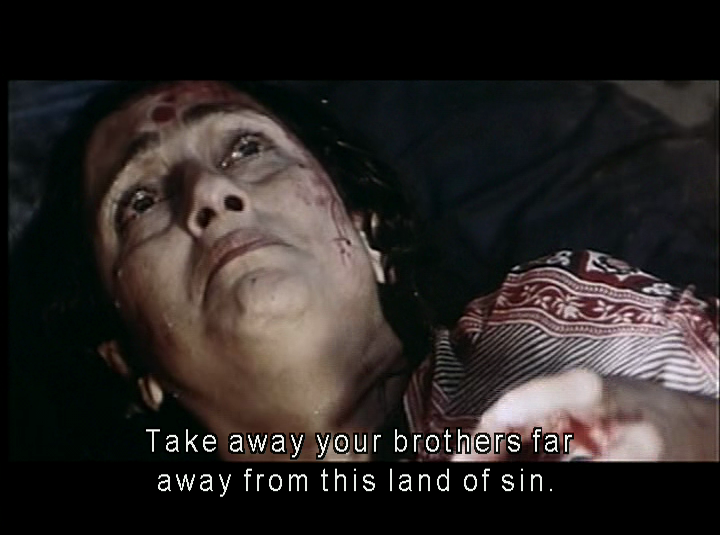 The only thing I recall about Deepa Sahi is a scene where she apologises for her inability to cope with the brothers’ demands and they basically reassure her that she’ll get better at housework with practice. There is a terrible family song, and many trite ‘together we five fingers make a fist’ speeches. I’d rather be an orphan! Danny Denzongpa is excellent but Bakhtawar is sidelined for the middle of the film so the best bad guy is largely missing. Anupam Kher is both comic relief and villain, and does neither well. The comedy track is hammy and misguided, and he doesn’t portray Girdhar with enough menace. The plot goes off the rails a bit when Girdhar carries the story and Anupam Kher’s performance does nothing to help the situation. Hum is tedious and ponderous where it needed to be a fizzy blend of melodrama, action and humour. It’s a sad misuse of some excellent talent and resources. 2 stars. This entry was posted in Bollywood and tagged Amitabh Bachchan, Annu Kapoor, Anupam Kher, Bollywood, Chinni Prakash, Danny Denzongpa, Deepa Sahi, Deepak Shirke, Govinda, Hindi, Hum, Kader Khan, Kimi Katkar, Laxmikant-Pyarelal, Mohan Kaul, Mukul S Anand, Rajinikanth, Rajni, Ravi Kapoor, Romesh Sharma, Shilpa Shirodkar. Bookmark the permalink. The giant Dodo hatched from Anthony Gonsalves’ egg in 1977, and spent the next 15 years hanging out in the officers club. Or at least, that’s what I heard. What a great idea – I would have thought he might have found slightly more salubrious surroundings though. 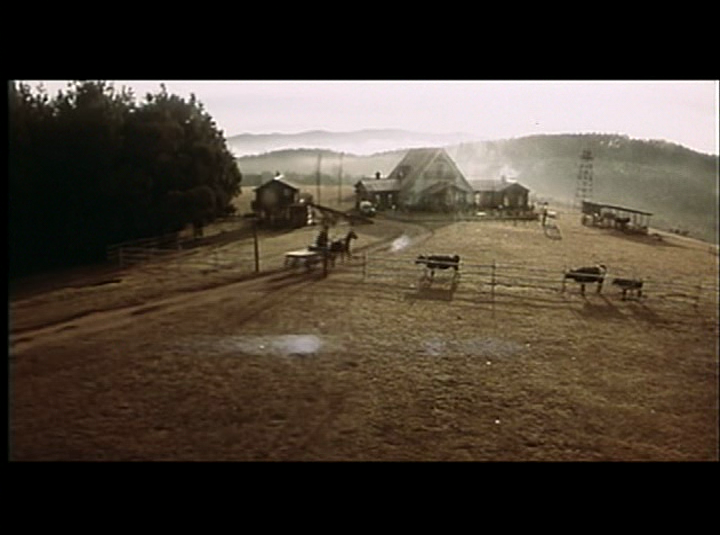 Maybe that was why he ended up in Ooty? It’s a very bizarre prop at any rate! Buffoonery is never a good thing, especially when combined with Anupam Kher!